Posh yet with a purposeful stride, our Red Charlene Vest would keep her composed and reposed in style during her train travel on the Burlington No. 1. Fashioned with all the details of a bygone era including antiqued decorative buttons, this vest is still perfectly instep for today. Made from a soft faux suede, is self backed in the same rich fabric, and fully lined in satin. Two front pockets on the front and a black satin tie on the back for fitting. I have bought other items from Historical Emporium for my son, & was very pleased with the clothing t hat I had bought for him. I have since purchased a antiqued copper-toned pocket watch with a chain, & had absolutely no issues with timing, etc. Came in perfect time for Christmas, & the watch was absolutely beautiful, and well made! 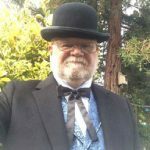 I've ordered several items from Historical Emporium for an Old West Saloon party we have every year. Each time, the product has been delivered earlier than expected and I've been very impressed with the quality. It's not costume quality clothing, but a very well made product. There was something wrong with the address on the last order I placed and someone contacted me asap. When I emailed back to provide the correct address, someone got back to me within the hour and my order was on its way, again delivered earlier than stated. It's rare to get that great of customer service anymore. I'll continue to use this company for all of our events!